The RV Patio is a hypothetical place that exists right next to your RV. Without outside accessories it doesn’t look like much, but with the right RV accessories it springs to life. It becomes more than a place to sit outside – it transforms into an outside living room. We’ve purchased many patio accessories, and while most have been excellent, some haven’t worked out. We thought it would be helpful if we shared our experiences with the stuff that we’ve tried. Note that we own and use everything on this page – we would never recommend something that we haven’t tried ourselves! Every RVer needs an outdoor patio mat. Before we began using an Outdoor Mat, we tracked an obscene amount of dirt, rocks, leaves, branches, and dead bugs into our RV – and this was just from sitting outside drinking coffee in the morning! 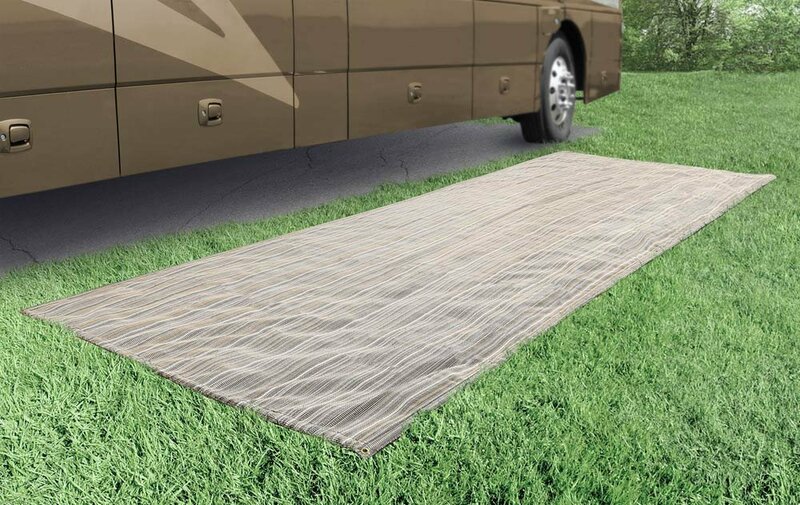 An outdoor mat has the added advantage of making any outside space feel like a patio, so instead of setting up your chairs on whatever rocks/dirt/sand/foliage are outside your door, you can look and act like a civilized person. 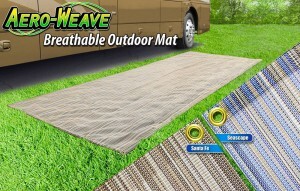 We prefer the Aero-Weave Outdoor Mat over other mats for several reasons. First, it’s made from PVC-coated polyester mesh which is very strong and durable and also allows water, dirt, air, and sunlight to flow through to the ground. This means you won’t kill grass that you cover, but also makes the mat very easy to clean and makes it lightweight and fast drying. Small insects (fire ants) can sneak right through the weave. Be careful placing the mat over fire ant nests! Heavy rain brings mud up through the weave, but it’s easy to clean off when the weather improves. You can read our full Presto-Fit RV Patio Mat Review By Clicking Here. Everyone that goes camping brings chairs. Whether you plan to sit around a campfire or enjoy drinking coffee outside in the morning like we do, outdoor chairs are a must. 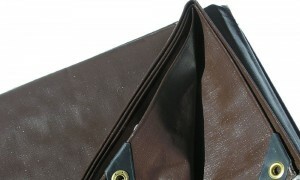 Originally we had collapsing chairs that fit in a bag. 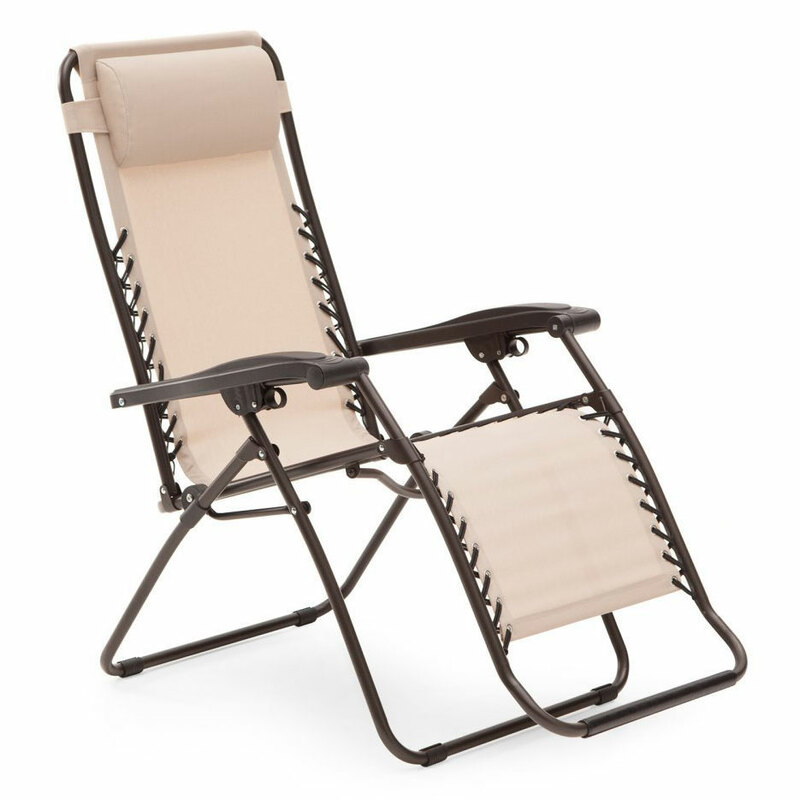 While those chairs are easier to pack away, they’re no-where near as comfortable as Zero Gravity Chairs. If you spend a lot of time RVing, and especially if you full time, comfy outside chairs are a must! We still see a lot of RVers that use uncomfortable chairs. People even use beach chairs which are really uncomfortable after a while – especially the metal bar that cuts right under your thighs. There’s really no reason to use torture chairs when super-comfortable zero gravity chairs are so inexpensive. 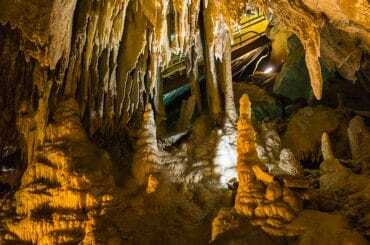 We recommend doing what we did – figure out where you can store them (we put them in our tow car), and bite the bullet with Zero Gravity Chairs. You – and your back/legs – will be very glad that you did! Now you’ve got your patio mat and your comfy chairs, but something is still missing – a side table! Now note, this is NOT a full-size table. It’s just tall enough (18″) to be a perfect side table that we place right between our chairs. It’s primary function is holding our coffee cups in the morning, but it’s also a good place to put snacks while watching our outside TV, a small lantern, our outside clock, and our citronella candle. 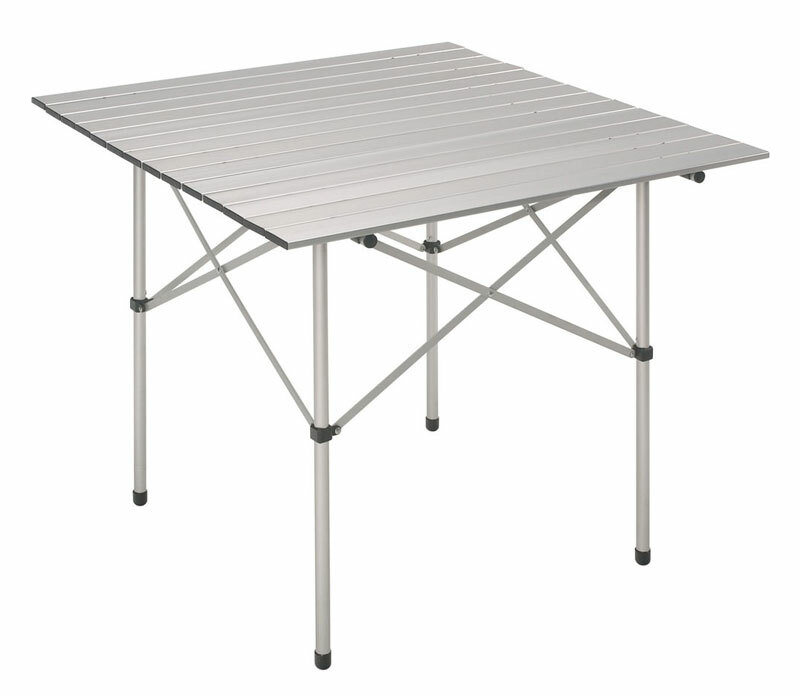 The best features of this aluminum table are that it’s super easy to setup and break down, and when broken down it takes up almost no room. You can literally pack it away anywhere. 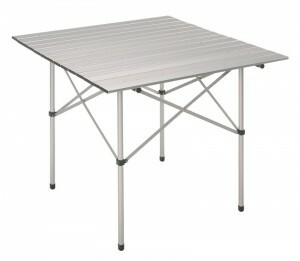 One note – I’m linking to the table on Amazon below, however we bought ours at Camping World. The tables appear to be the same, however the brand is different. 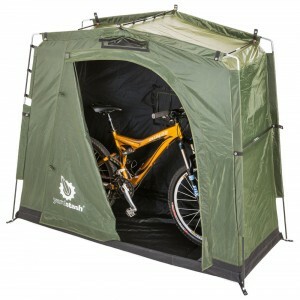 They do have these in stock at Camping World, so check there first. More chairs? You bet! While our two gravity chairs are perfect for our campsite, there are many times that more portable chairs come in handy. 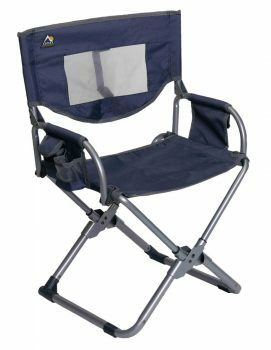 These chairs are perfect for when other people visit, to bring to RV Park events like bonfires and cookouts, to bring fishing, or to bring to the beach for just a few examples. The key to ‘extra’ chairs is making sure they take up next to no space, and in this department the GCI Outdoor Director’s Chairs are perfect. The chairs fold up almost flat at just over 2-inches thick. That makes them an ideal candidate for storing behind the couch, which is where we keep them, or to stack in a storage bin or in a tow vehicle. Breaking them down is super fast and easy . . . once you get the hang of it. After living with the Yardstash for the past 2 years, I honestly don’t know why more RVers don’t use them. A large percentage of full-time RVers have bikes with them, and yet most leave their bikes outside where they’re exposed to rain, dust, dirt, and thieves. 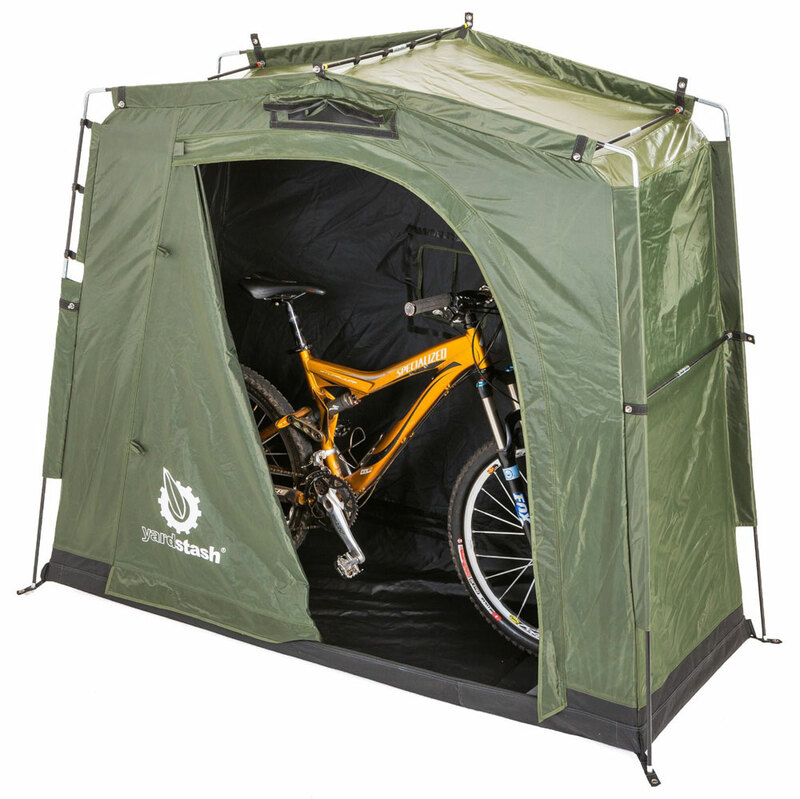 Not only does the Yardstash protect bikes from weather, but by hiding our bikes a thief is much more likely to target someone else at the campground. Not only that, but I set the Yardstash up against a tree and use a length of chain to secure our bikes inside through the Yardstash’s back window – just in case a thief gets curious. Not only is the Yardstash II perfect for storing bikes, but it’s good for storing anything and everything else including bike racks, chairs, my gas can, extra hoses, and stuff that’s in the car if we need the back seat. Long story short, the Yardstash is like bringing a portable garage and it’s always a handy thing to have! You can read my complete Yardstash II Review by clicking here. The shock-cord (stretch cord) holding a few of our poles together broke after 2 years of use, although that’s easy to fix/replace. While not exactly a Patio Accessory, a good tarp is a must have RV accessory. We chose brown specifically because we didn’t want the tarp to stand out at the RV park like a bright blue or bright green tarp would – we try to stick to natural colors whenever possible. Not all the accessories we’ve bought have worked out, and the Volcano in particular was one that we wish we hadn’t purchased. We had a good reason for choosing the Volcano. Our storage bins are relatively small, and the Volcano collapses to only 5-inches tall. It’s far and away the smallest grill we could find, and it does fit well into our storage bins. The Volcano does do an excellent job of grilling things. It can use either wood, charcoal, or propane (with adapters), and the grill gets very hot and cooks very quickly. 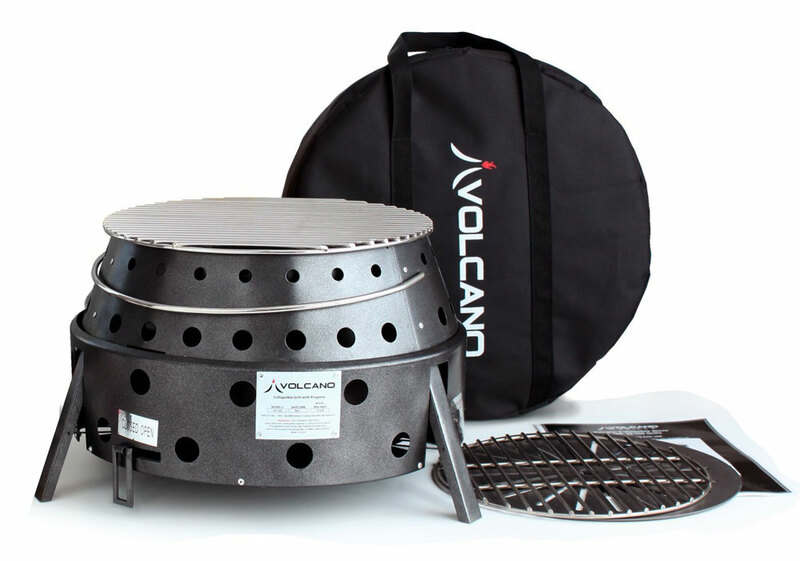 It also works well with dutch ovens as you can place them right in the Volcano, and the Volcano has an available cover for that purpose. The problem with the Volcano is that it doesn’t deal well with the elements at all. It’s literally a rust magnet. After the first use the entire inside coating baked off, and from then on it rusted. The cooking grate also rusted quickly, and it’s impossible to find a stainless steel grate to replace it – we’ve looked extensively! The big problem with rust is that the grill is designed to collapse quickly and easily. With a little bit of rust it no longer performs as designed. It’s a struggle to collapse it and a struggle to extend it – even though I’ve oiled and wire brushed the Volcano extensively. It could be that our storage bins don’t stay as dry as they need to, or that we’ve been in some wetter climates, but long story short the Volcano isn’t ideal for the kind of RVing we’ve been doing unfortunately. We’re still not sure what a good alternative grill is, but we’ll let you know if/when we find one. In the meantime if we want to grill I still use the Volcano and it still works well – it’s just more difficult to setup and break down than we’d hoped. After several years with no grill, we recently purchased an O-Grill 500 and love it! We first saw the grill in use when meeting some RV friends in Tucson, Arizona. They used the grill to cook up some fish, and when they were done, the grill folded down small and packed away easily. We’ve been pan frying food pretty extensively for years, so we were both excited at the idea of grilling up food this summer instead – grilled Salmon, Chicken, Burgers, Veggies, Corn on the Cob, etc.. sound amazing! I’ve already cooked several pieces of fish and chicken on our new grill, and I have to say it does an amazing job. Check out this chicken I cooked – it’s tender and juicy. It was literally some of the best chicken I’ve ever had (if I do say so myself). 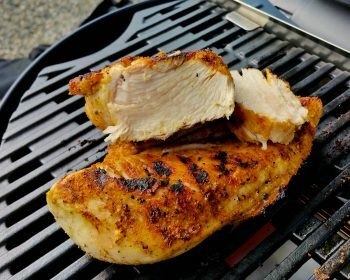 One of the best things about the grill is that the legs fold flat, so you can fit the grill into very small RV storage bins – or even behind a sofa or under a bend seat. At the same time, the O-Grill has a fairly large cooking area, so you can easily grill up food for a family. Clean up has been easy so far – the grill removes easily for cleaning, and the drip tray is also easy to access and clean. 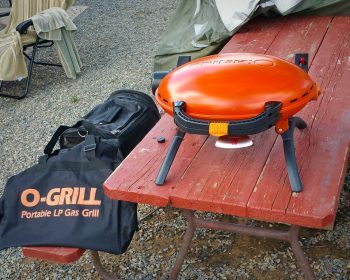 The grill uses 1-pound propane canisters or can be used with an adapter and a larger propane tank. It’s a perfect setup for RVers – we’ve seen O-Grills all over the campgrounds we stay at, and we’re happy to finally have one of our own! You may have noticed throughout this article that I talk a lot about the weather and rust. When you RV everything gets exposed to the elements and everything gets exposed to moisture in spite of your best efforts. If it can rust, it will rust! 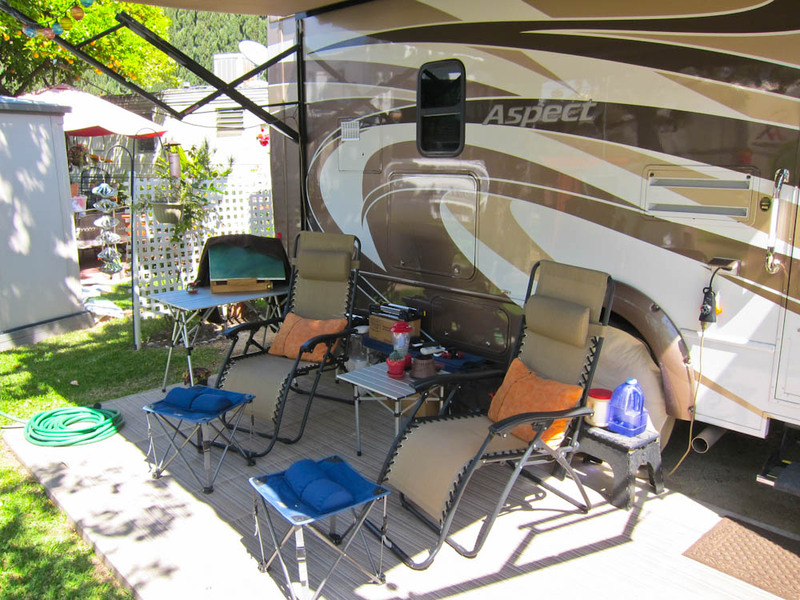 The RV Patio (complete with your RV’s awning) is one of the most useful and important spaces in (next to) your RV. We also hang lights from our awning, and use a timer we purchased at a hardware store that automatically turns the lights on at dusk for either 2 or 4 hours (Edit – I found it on Amazon: Woods Outdoor 24-Hour Mechanical Outlet Timer with Light Sensor), which adds a nice touch in the evenings. Many of our neighbors use LED rope lights around their patio, or solar path lights which add a nice touch. The key to any of this stuff is make sure you buy things that are durable and things that will last, even if they cost a bit more. Otherwise you’re literally throwing your money in the trash and adding junk to a landfill. 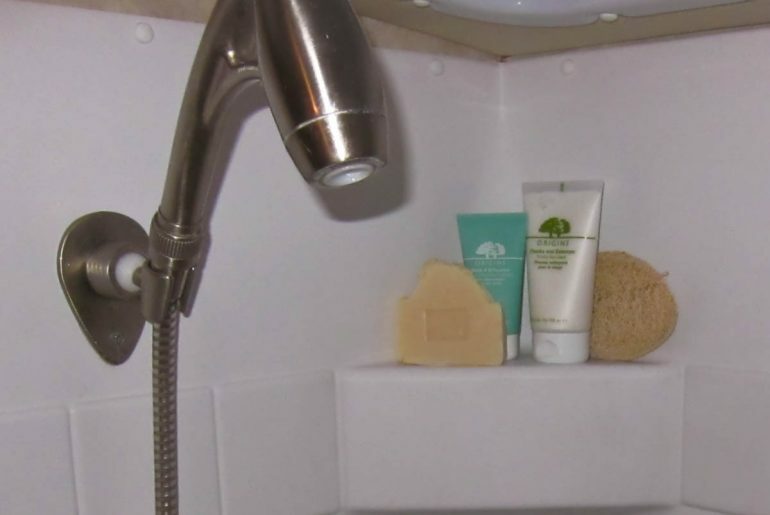 Originally I had planned to make the article about all types of RV accessories, but once I got started I realized there were too many total accessories for one post. Going forward I’ll sprinkle in a few more accessory posts to cover different systems and RV features (kitchen accessories, sewer/holding tanks, electrical, etc..), so stay tuned for those. I hope the preceding list is helpful. 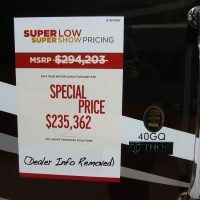 There are so many different products available for RVs, and it can be difficult to know what products are worth the money and which are a complete waste. If you have any questions about any of the products in this list, please ask in the comments, and until next time, happy trekking! I actually love my Volcano Grill ! Haven’t experienced the rust problem. It is great for Dutch Oven cooking !! Hi Rob – it’s definitely great for dutch oven cooking, but the lack of metal cover and small grill space with no edge (food easily falls off) make it a less than ideal grill for our purposes. We are getting back into RVing after a long absence from it. We started out with a 5 year old 1965 Apache Silver Buffalo pop-up. We now have a Jayco Pinnicle 5th wheel which we are packing now and are waiting on the truck we had to order to tow it! We are planning a trip to circle the US. Not being spring chickens we are planning to stop every 400 miles and spending 10 days at each location. 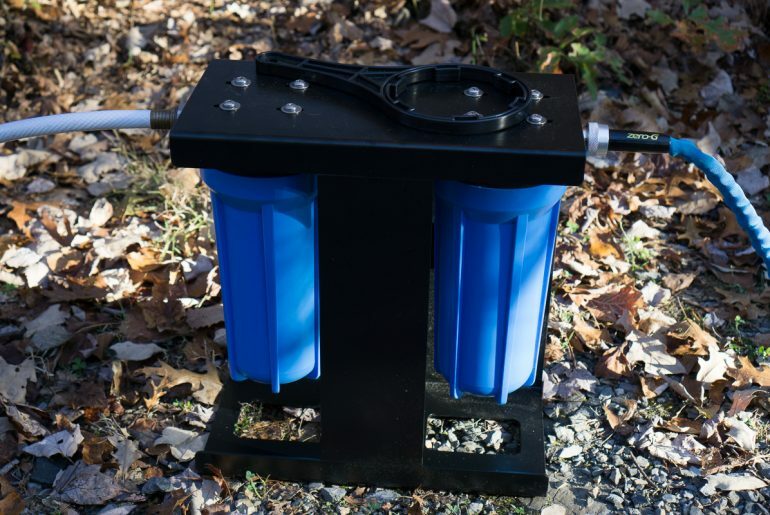 I started viewing your site to gain information on the water regulator/filter section. Thought it was great and very informative. Then went on to view the rest of your topics. I have found it all to fall under the ‘Great Stuff’ category and I hope you continue to publish your findings and preferences. Hi Mike – thanks for your comment and feedback. It’s great to hear that you and others have found our content helpful. Congratulations on your planned trip – sounds like fun! You guys are definitely doing the right thing with your 400 miles/10 days plan. We try to do exactly the same or even slightly slower – 14 or 21 days works for us, but we also still work jobs, so slower is better. Have a great trip, and let us know how it’s going! Hi Stephen – It doesn’t cost anything to subscribe. All our content is free for everyone – and we appreciate it if you use our Amazon links on stuff you’re going to purchase anyway. It sounds like you have a good plan. 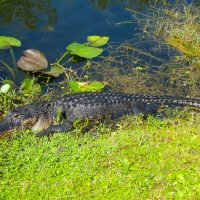 We’ve been on the East Coast since last July, and have been enjoying it very much – especially southern Florida like the Everglades and the Florida Keys! If you’re looking for daily updates, we do update our Facebook page very regularly (much moreso than our website). You can find our Facebook Page by clicking here, and if you have a Facebook account please ‘like’ our page for daily updates. Thanks for your comment and happy travels!